Finding your way about underwater is not a matter of luck. Underwater navigation can be challenging, but in the PADI Underwater Navigator Speciality course, you master the challenge. You learn the tools of the trade. 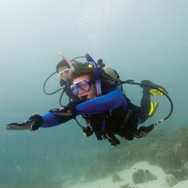 Three dives are required, If you have completed the Underwater Navigator dive as part of the Adventures in Diving program that dive may count as the first dive of this course.